Update (2009-07-12): Download links for isxunpack.exe and i6comp.exe added. Microsoft’s new Snipping Tool in Windows Vista and higher makes it easier to take screenshots of pictures than having to do Print Screen. There is a backport of this tools called Snipping Tool, but it will only install if it thinks you are running on a Tablet PC. It is part of the Microsoft Experience Pack for Tablet PC package which also features the Royale theme. However, it will only install on a tablet PC and on nothing else. Here is how to extract and run it on a regular PC. Download Microsoft Experience Pack for Tablet PCs. 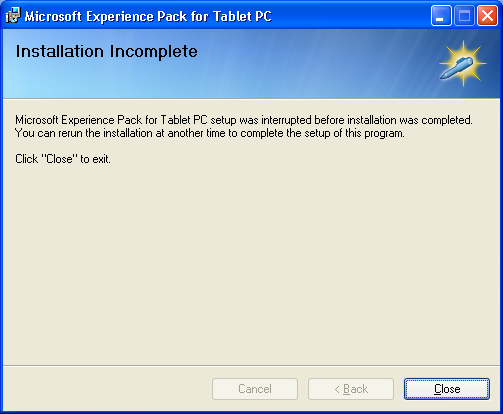 Attempt to run it and you should receive an error message about how it can only run on tablet PCs. 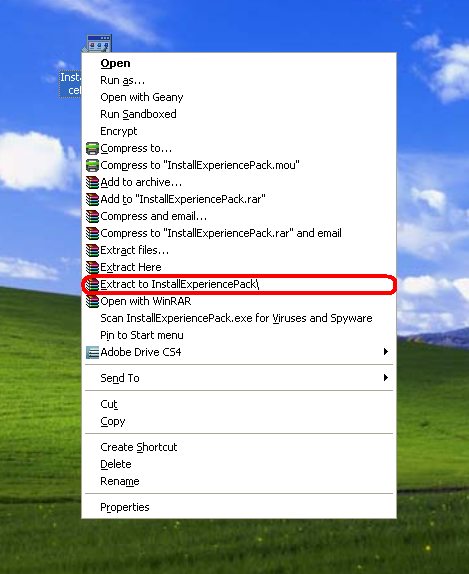 Extract the .msi file from the installer by right clicking and selecting “Extract to InstallExperiencePack\“. Open a command line and navigate to the newly created directory and type in “msiexec /a Launcher.msi“. A window should pop up. Click next and specify a temporary directory. After files have been extracted, open the directory in Explorer and navigate to the “Microsoft\Experience Pack\Data” sub-directory. Open a command line and navigate to the directory and copy isxunpack.exe into it. Run “isxunpack SnipTool.exe” in the command line. Browse to the new sub-directory “Disk1“. 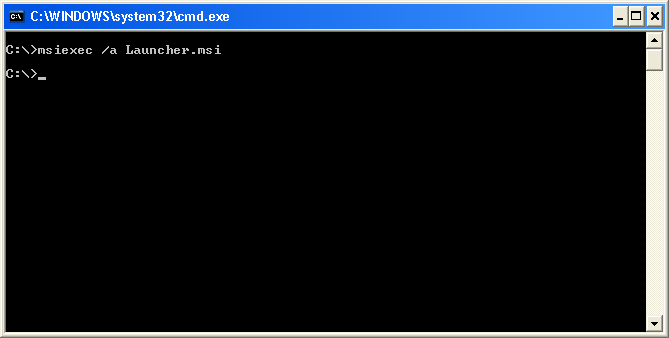 Open a command line and navigate to the new directory and copy i6comp.exe into it. Run “i6comp.exe e data1.cab” and ignore the errors. In the Disk1 directory, look at the file SnippingTool.exe and run the file. Note that the tool will not run on nLited Windows installs without IE/WMP. Since isxunpack.exe is almost impossible to get, do you know of another tool that will do the same job? 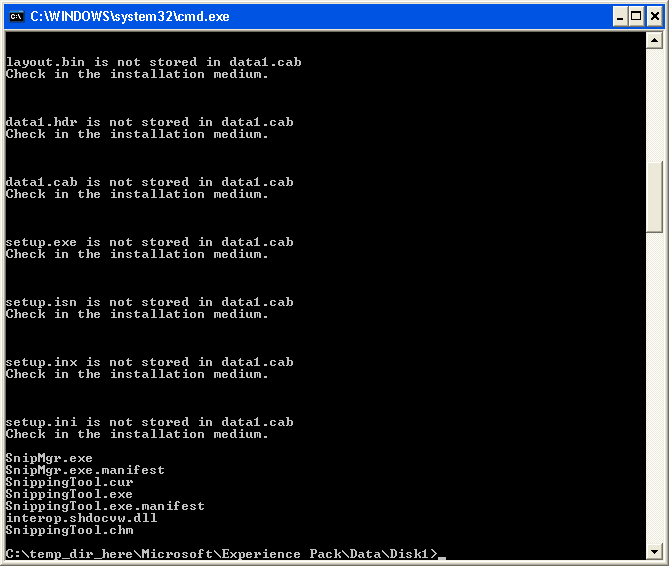 I got an error saying “Could not load/init the much needed ZData dll” and SnippingTool.exe is not there on step 12-13. Anyone Get around the error” Could not load/init the much needed ZData dll”? If so, how? Get this version of i6comp it resolved the zdata error others have noted. Link Chris provided worked, i6comp.exe is located at the “Resource” folder. Thanks. Got it to run but there were no errors found, unlike step 12. SnippingTool.exe and other extracted files are located in the” \Disk1″ folder. Running the program didn’t work; received this error: “Snip Tool has encountered problem, needs to close”. Then another error shortly: “DDE server did not acknowledge the command. App=, Topic=”. I am running Windows XP Pro, SP2. didnt work for me either. i got the same errors as everyone else when it came down to the last step and the link provided is broken. i tried finding another i6comp.exe on the web, i got the files scrolling but i get teh same error the other guy is getting. snip tool has encountered and error and needs to close. o well. same error “Microsoft Snipping Tool has encountered a problem and needs to close”Then another error shortly: “DDE server did not acknowledge the command. App=, Topic=”. I get the “Microsoft Snipping Tool has encountered a problem and needs to close”; but not the second error? Looking to see if moving some files to system32 helps…. I was looking for the solution to the “Microsoft Snipping Tool has encountered a problem and needs to close” message too. The discussion of this work around seems to have died off. Was a solution ever found to the problem? Or have people given up on the problem? 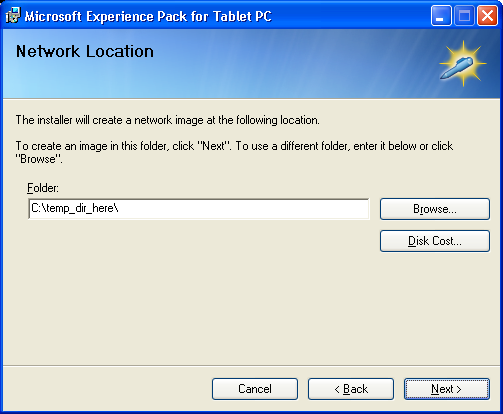 Choose custom install and install ONLY the Tablet PC Runtime Components and Ink Controls. Red “X” everything below that as you do not need it. Let the installer finish and now you can enjoy your new Microsoft Snipping Tool utility without any errors. Alternatively, I have upped a ZIP with the extracted tool ready to go and it includes the XP Tablet PC SDK installer as well. I used these same steps with the newer i6comp02.zip and IsXunpack and everything worked peachy. I have installed the Microsoft Snipping tool the way you asked to do, however I dont see any icon or way to use the snipping tool. How should I access the snipping tool. Please help. Have tried all the methods up to 16 except for the file download “…./SnippingTool.zip_links” as what downloaded was called “iLividSetupV1.exe” and I didn’t trust it due to the name difference. The SDK install appeared to run correctly but there was no trace of the snipping tool on my Server 2003. Don’t understand Tim’s comment “READ FROM DOWN TO UP”. So…is this really dead? I could really use this tool for the boss. Or should I just get her Snag-It? ok it does work on Windows XP Pro. Follow the site’s instructions points 1-13, BUT use the “icomp6.exe” file referred to in Post# 10, not the one from the site’s “Requirements” list. I have got it running successfully on two Win XP Pro PCs, so it should work for others.